During her 2014 New York ReLeaf Conference plenary talk, Urban Horticulture Institute Director Nina Bassuk lifted up some underutilized trees for urban use. One of them, American smoketree (Cotinus obovatus) was growing just outside the conference room doors on the Hofstra University campus, where a mature specimen stood protectively behind a newly planted youngster. American smoketree is native to the U.S. South and Midwest. Naturally and by training, American smoketree has a more tree-like habit than European smoketree (C. coggygria), and it matures up to 30 feet (9 m) tall and 20-30 feet (6 to 9 m) wide—twice as big as C. coggygria. It is hardy to zone 4 or 5, depending on which reference you consult. It is deer resistant and tolerant of drought and poor soils but doesn’t like to have wet feet for prolonged periods. Missouri Botanical Garden voted it one of its “Tried and Trouble-Free” tree species. The NYS Urban Forestry Council is pleased to announce available funding for projects in small communities (population up to 65,000) to have an Arbor Day event and begin a community forestry program. This funding is provided by the USDA Forest Service and the New York State DEC Urban Forestry Program. Grants of up to $1,000 will be awarded to communities or non-profits that work in partnership with municipalities to celebrate Arbor Day 2015 and form a shade tree committee within the municipality. Previously we featured super dynamo Council cofounder Nancy Wolf. Continuing in that series, we talk here with another beloved Council cofounder and current board member, Cornell Urban Horticulture Director Nina Bassuk, who prefers to go by “Nina.” We asked her about her recollections about the early days of the Council. In a subsequent post, we’ll get some updates about things going on in the life and garden of Nina and her husband, the landscape architect Peter Trowbridge. Nina, a native of NYC, received her bachelor’s degree in Horticulture at Cornell and then went on to receive her Ph.D. from the University of London while carrying out her research at the East Malling Research Station in Kent, England. Her current work in Cornell’s Urban Horticulture Institute focuses on the physiological problems of plants grown in urban environments, including plant selections, site modification and transplanting technology. Nina is the coauthor with her husband of Trees in the Urban Landscape, a book for arborists, city foresters, landscape architects, and horticulturists on establishing trees in disturbed and urban landscapes. Nina is on the technical advisory committee of the Sustainable Sites Initiative (SITES) and helped to develop the Student Weekend Arborist Team (SWAT) to inventory public trees in small communities. She is a recipient of the Scott Medal for Horticulture and an ever-popular speaker at the ReLeaf Conference. Nina Bassuk on the Council’s Origins: “The impetus for the creation of the Council—which was then known as the NYS Urban and Community Forestry Council—was the fact that federal grants were coming from the US Forest Service to the states for the first time for urban forestry related projects. Each state had a different way of handling the grant funds; for instance, in Pennsylvania the money went through Cooperative Extension, while in New York the money went through DEC.
One of the requirements of the federal grants was to have an advisory group advising the DEC, who would in turn handle grants to municipalities, on urban forestry matters. The state foresters had to learn about urban forestry in a hurry! Some of them embraced the new urban forestry aspect of their positions, while others didn’t. This essay comes to us from NYC Parks Forester Bill Schmidt. 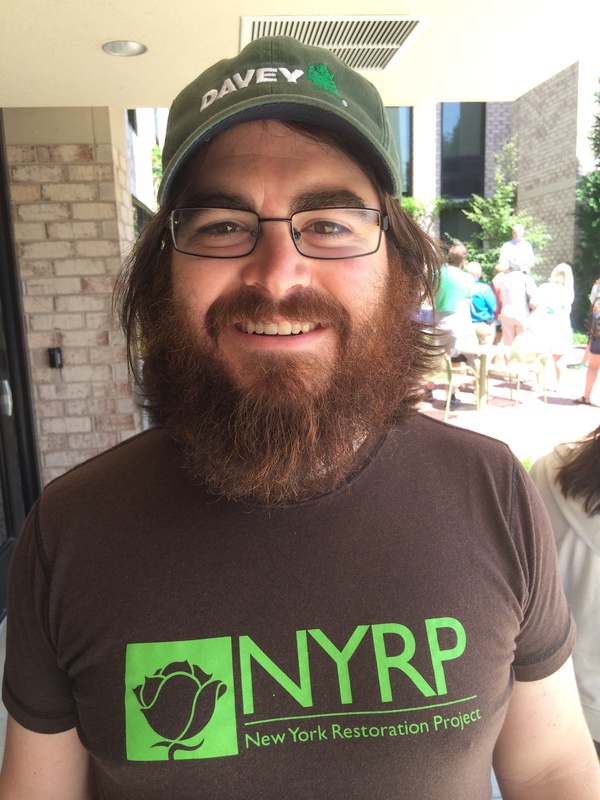 Bill is a Certified Arborist who coordinates urban forestry for the Greening Western Queens project. Last Sunday, September 21, 2014, I joined over 300,000 of my fellow human beings in Manhattan for the largest climate change march in history. I was delightfully overwhelmed by the incredible turnout and the diversity of the participants. There were young people, senior citizens, middle-aged Gen Xers like myself, faith-based organizations (I was marching next to a lovely group of elderly nuns), Native and African American groups, and organizations representing a variety of issues not directly related climate change who were marching out of solidarity. It was a truly inspiring experience. During the march, I thought about what climate change meant to me as a forester, a father, and a global citizen. When I returned to the office Monday morning, a colleague suggested that I should encapsulate these thoughts about the march and share them with others in my field. So, here is my attempt to express how I felt in eight paragraphs or less.